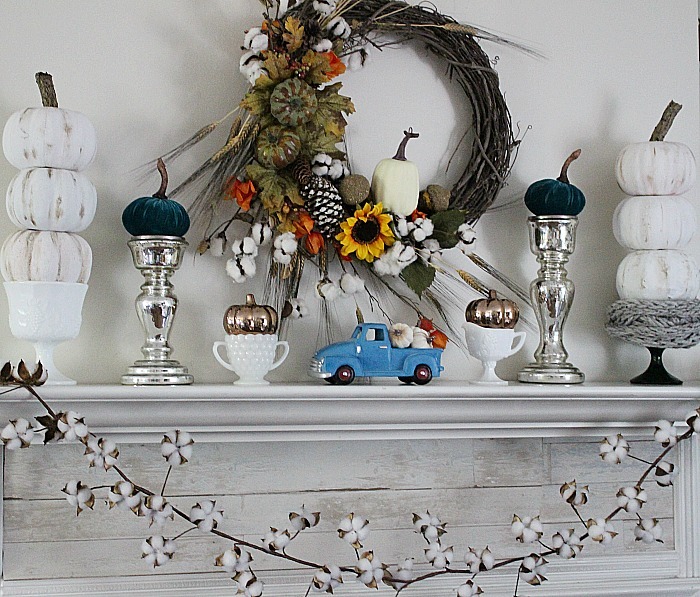 Today I’m sharing my farmhouse style neutral fall mantel! Fall is seriously my favorite time of year. Living in New England we have some of the most beautiful fall foliage you ever did see. Plus, the arts and crafts fairs started last week which means I am a very happy girl! You may recall our series that began in the spring called Decorate Your Mantel. 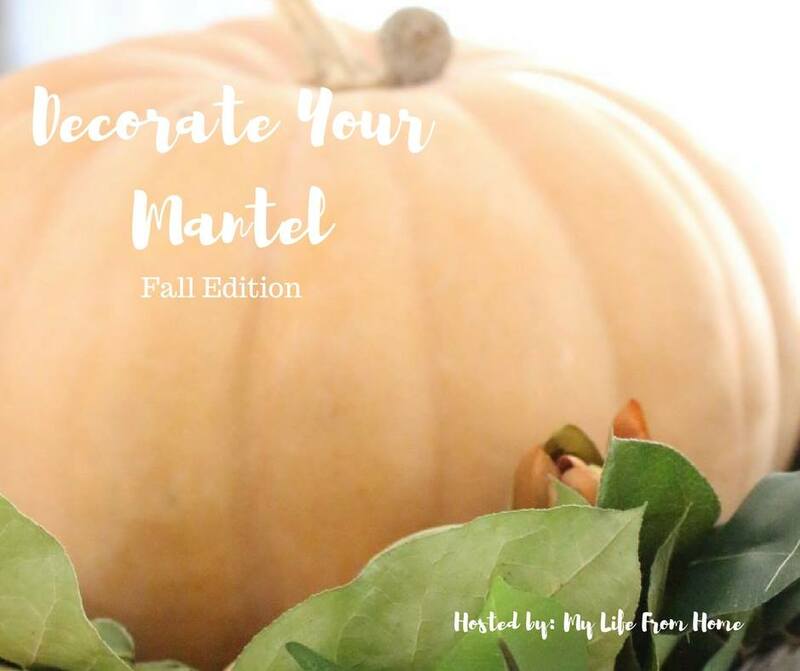 We are back with the fall edition and have so many of your favorite home decor bloggers sharing their mantels with you! Please be sure to visit the other blogs linked below. 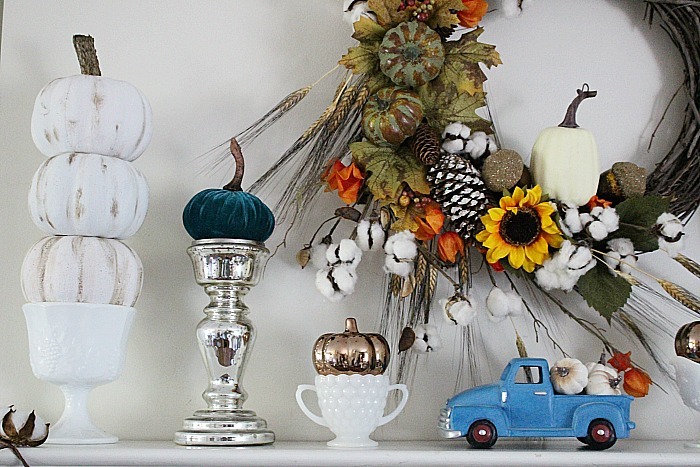 We are hoping to inspire you to to update your mantel for the beautiful fall season! For me fall is all about nesting. That means bringing out the cozy throws, stocking the fireplace with wood (or duraflame logs) and updating my home decor to reflect the cooler temperatures. While I will always love the classic fall colors of oranges and rusts, my color scheme in my home is more neutral with pops of blues. So I decided to stick with the same color scheme for my mantel and fall decor. By keeping my decor neutral it is very easy to infuse color and add the farmhouse touch that I love. Normally when I decorate a mantel or a tablescape, I always start with an inspiration piece. For this fall mantel, it is definitely the rustic fall grapevine wreath that I shared in a guest post at Centsible Chateau. This wreath has everything I was going for, as it was neutral but had pops of color in the sunflower and pumpkins. 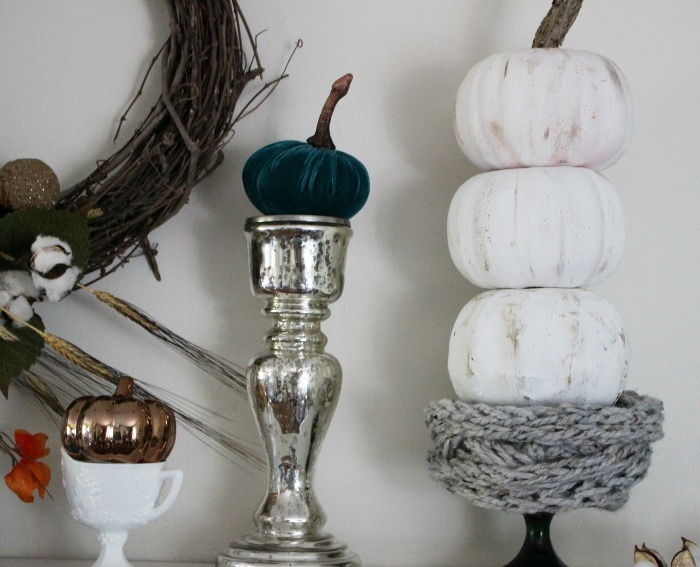 Plus, I never tire of cotton stems and white pumpkins! I am very careful to decorate on a budget, which is one of the many reasons I am thankful I enjoy crafting. You can really save money by making your own decorations. 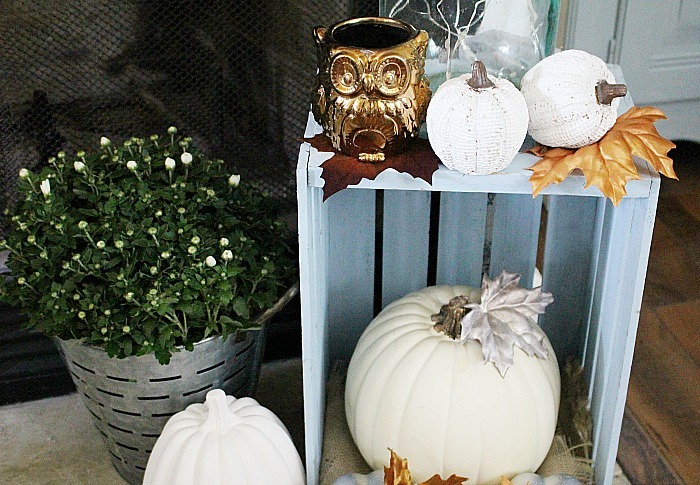 The Dollar Store is another great way to keep costs down but still decorate for each season. I recently shared how I used Dollar Store pumpkins to make the cute pumpkin topiaries that anchor the mantel. You can see how I made these here. Once I had the wreath up and the topiaries on each end, it was just a matter of filling in the mantel. You see those two lovely blue velvet pumpkins? They were in the dollar spot at Target! You can’t beat that and you definitely can’t make velvet pumpkins for $1! I bought the only 3 the store had and they have yet to restock, so I think I was very lucky to find these. Copper pumpkins also from the Dollar Store fit perfectly in thrifted milk glass. For all of the pumpkins on the mantel the cost was $12 including the ones in the truck! 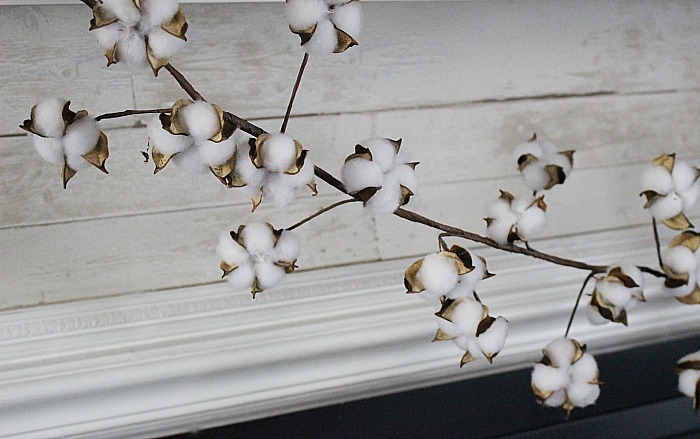 This cotton boll garland is from Oriental Trading and is absolutely beautiful. Oriental Trading is not just for party supplies and I have found so many great home decor pieces, especially for the Holidays. Wait until you see the magnolia wreath I will be sharing later this week. Keep them in mind if you are looking for inexpensive, on trend items. 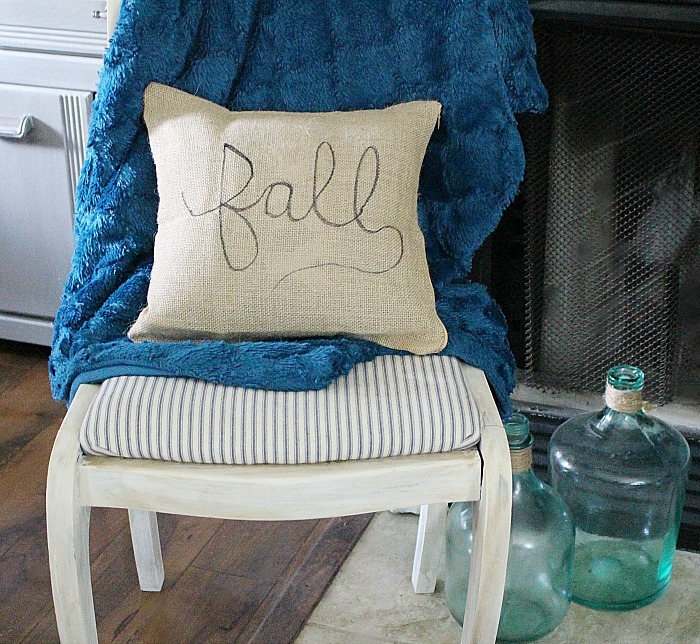 For the hearth I kept it simple with a burlap pillow and a blue velvet throw, to tie in with my velvet pumpkins, on an antique chair on one side. A mum in my favorite olive bucket with a few white pumpkins in an old crate complete the other side. I normally have real pumpkins but it is a little too early in the season yet. I hope you enjoyed this Farmhouse Style Neutral Fall Mantel. 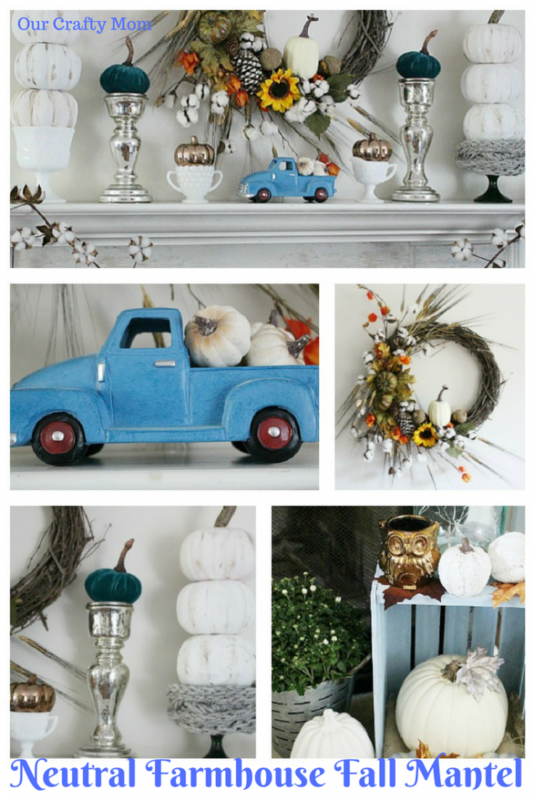 Please visit the other bloggers linked up below for even more fall mantel inspiration! I would love it if you would subscribe to my email so you never miss a post. Have a great day! Oh how I wish I lived in New England like you! I’ve always admired the beautiful landscape during the fall. Your mantel is beautifully decorated, and I absolutely love that wreath! Gorgeous job! I love all of the blue! That little truck is too cute! So is that crate! Awe, I love the blue truck! It pulls it all together so beautifully! The fall wreath is gorgeous. Such a pretty mantel. Great job! Blue truck is so cute! Love white pumpkins, they are so hard to find here in Italy ! Really pretty Michelle! 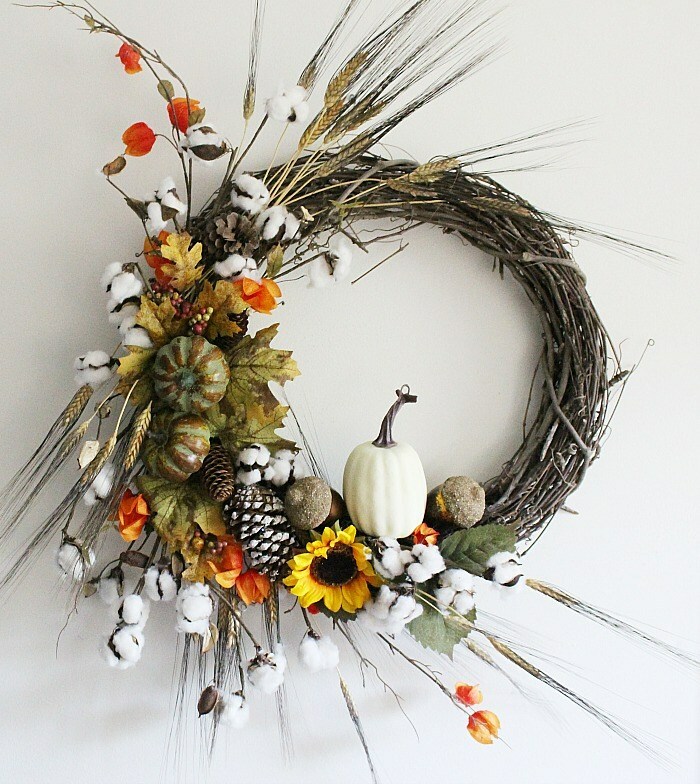 Love that wreath, all your pumpkins and that cotton garland! 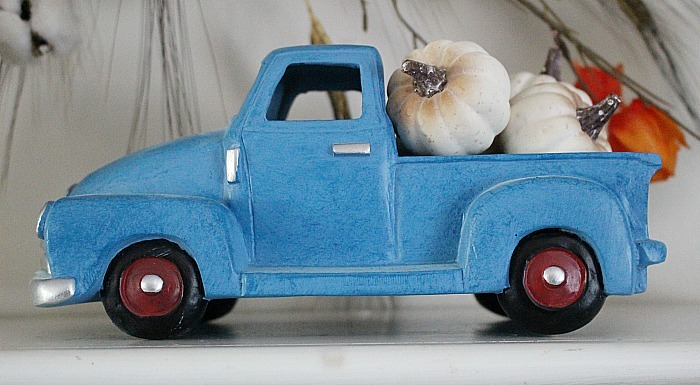 That blue truck with pumpkins in the back is the cutest addition to the Fall mantel. I especially love the wreath (so pretty!!!) and how perfectly it goes with the cotton boll garland. Stopping by from the #HomeMattersParty linky. Your mantel is so charming. I love the sweet touch of the truck. 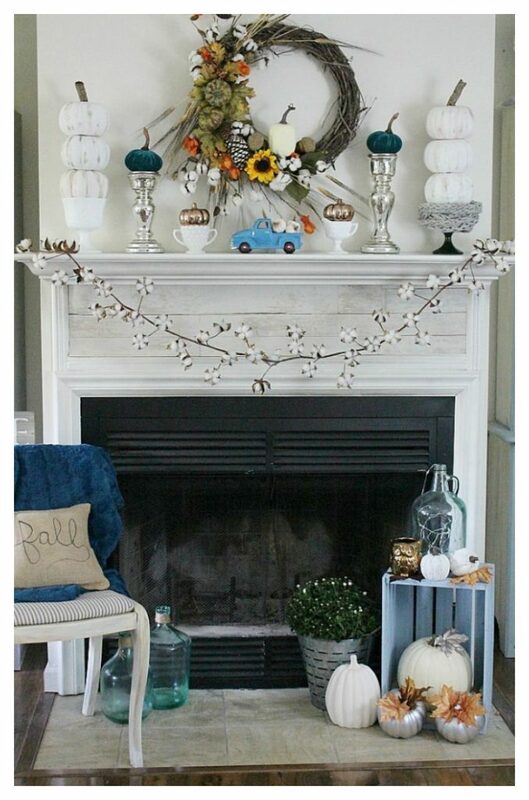 I love this mantel, that blue truck is so cute, such a pretty color! 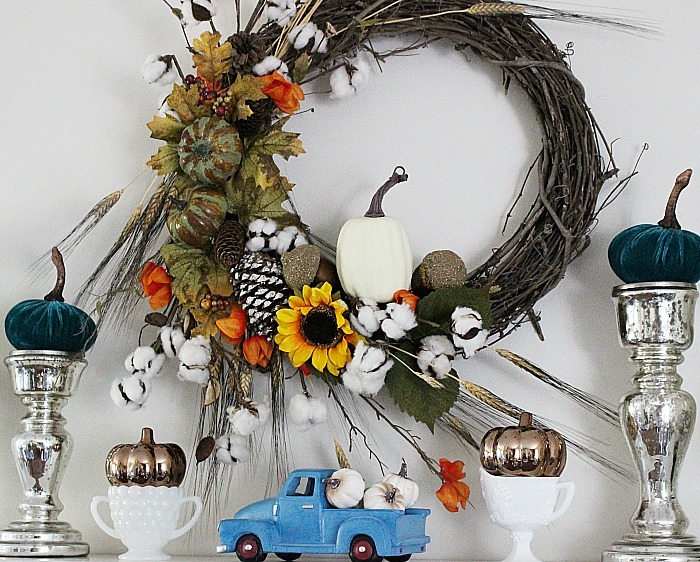 Your mantel is perfect for fall, but that wreath! I must have missed that, it is so beautiful! Great job, Michelle!